An announcement from the state Attorney General’s office Tuesday was made in response to growing concerns regarding the potential negative impacts of the continuing work on the Mariner East 2 pipeline, also known as the Pennsylvania Pipeline Project. Attorney General Josh Shapiro announced the launch of an investigation via his Twitter account following a referral made by Delaware County District Attorney Kat Copeland March 1. He added that this action is part of a fight to protect Pennsylvanians. The Mariner East 2 project was originally announced in early November 2014 and was designed to take a parallel path alongside its predecessor, the Mariner East 1, as it transmits natural gas liquids from western Pennsylvania to the Marcus Hook Industrial Complex near the Pennsylvania Delaware border. The 350-mile long pipeline travels the length of the state from the western part of the Commonwealth to Marcus Hook in Delaware County, transecting Penn, Union, Shirley and Tell townships in Huntingdon County. The entire expanse traverses 17 counties in the southern tier of Pennsylvania. The project’s progress has been marred by reported violations, most recently resulting in the state Department of Environmental Protection (DEP) placing a hold on all clean water permit approvals and modifications submitted by the project’s parent corporation, Energy Transfer Partners (ETP), due to non-compliance. The hold was announced Feb. 8. In Chester County, where the pipeline has been identified as the likely cause behind explosions, sinkhole formation and stream pollution, the county’s district attorney launched a criminal investigation into Sunoco Pipeline. Last month, the county commissioners announced their interest in joining residents in their lawsuit against the pipeline company. 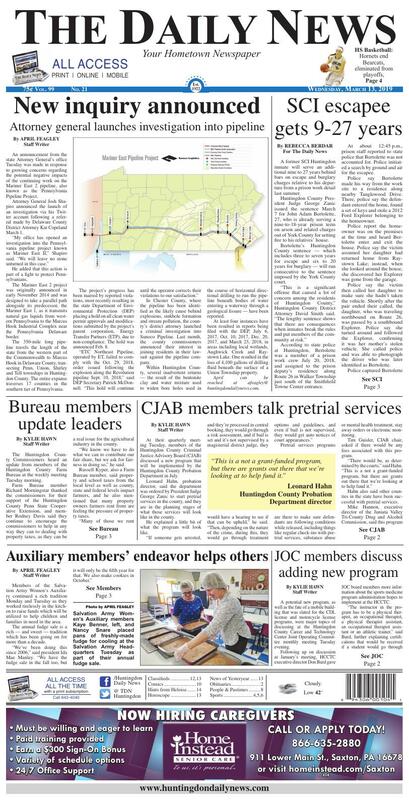 Within Huntingdon County, several inadvertent returns — the result of the bentonite clay and water mixture used to widen bore holes used in the course of horizontal directional drilling to run the pipeline beneath bodies of water entering a waterway through a geological fissure — have been reported. At least four instances have been resulted in reports being filed with the DEP, July 6, 2017, Oct. 10, 2017, Dec. 20, 2017, and March 23, 2018, in areas including local wetlands, Aughwick Creek and Raystown Lake. One resulted in the loss of 4,100 gallons of drilling fluid beneath the surface of a Union Township property. At their quarterly meeting Tuesday, members of the Huntingdon County Criminal Justice Advisory Board (CJAB) discussed a new program that will be implemented by the Huntingdon County Probation Department in July. Leonard Hahn, probation director, said the department was ordered by President Judge George Zanic to start pretrial services in the county, and they are in the planning stages of what those services will look like in the county. He explained a little bit of what the program will look like. Pretrial services programs are there to make sure defendants are following conditions while released, including things like regular check-ins with pretrial services, substance abuse or mental health treatment, stay away orders or electronic monitoring. Tim Guisler, CJAB chair, asked if there would be any fees associated with this program. Hahn also said other counties in the state have been successful with pretrial services. Mike Hannon, executive director of the Juniata Valley Tri-County Drug and Alcohol Commission, said this program not only keeps defendants out of jail, but keeps them in much needed services, especially if they have drug and alcohol issues. “You’ll get more cooperation to follow up with services they need if it’s part of their conditions during pretrial services,” he said, noting Mifflin County also has pretrial services. In giving his update Tuesday, county jail warden Duane Black said the population went to over 100 inmates very recently, but has gone down to the 90s. Guisler asked Black if a program like pretrial services would help low the jail population, as it’s been a struggle to manage in recent years. “I think programs like that are good programs, but ultimately, their Band-Aids,” he said. “They put the population down for a little bit, then it comes back up, but there comes a time when something needs to be done (with the size of jail and the population of inmates). Black, however, said he’s thankful for everyone, from Zanic to probation to other offices of the court, for their help in supporting the jail. County planning director Mark Colussy said he wants to discuss potential inside ways to study the jail population. Hannon, in his update, said funding for drug and alcohol programs is out there, but expressed frustration with the competitive nature of grants, considering many agencies work together, but often have to compete with one another to obtain the grants. “We have to be picky with what grants we want,” he said. Hannon said they’ve been able to hire two case managers last year, and they’re hiring two more, including one that will work with Children and Youth Services and probation in Huntingdon County. County emergency management director Joe Thompson also followed up on the December CJAB meeting regarding how the county would deal with mass casualties in an event of a large overdose situation. “We’re hoping to do some training in May with county and regional responses,” he said, noting he’s willing to partner with other agencies to do a tabletop exercise on the issue. Salvation Army Women’s Auxiliary members Kaye Benner, left, and Nancy Snare placed pans of freshly-made fudge for cooling at the Salvation Army Headquarters Tuesday as part of their annual fudge sale. Members of the Salvation Army Women’s Auxiliary continued a rich tradition Monday and Tuesday as they worked tirelessly in the kitchen to raise funds which will be utilized to help children and families in need in the area. The annual fudge sale is a rich — and sweet — tradition which has been going on for more than a decade. Now utilizing the long-awaited renovated kitchen at the Huntingdon County Salvation Army headquarters, the volunteers filled the space as they mixed, stirred, poured and cut. Customers look forward to the opportunity to purchase the variety of flavors produced, including chocolate, chocolate peanut butter, chocolate nut and peanut butter. The laughter that rings out from the kitchen and processing area highlights the shared sense of purpose and camaraderie the members enjoy. The bottom line is that the sweet treats made in the kitchen by the auxiliary members makes an even sweeter impact on the lives of the county’s residents. The Huntingdon County Salvation Army is a Huntingdon County United Way participating agency. Another project on the horizon for the Women’s Auxiliary is the compilation favorite recipes for a cookbook. Those interested in submitting a recipe are invited to contact the Salvation Army at 643-1430. The Huntingdon County Commissioners heard an update from members of the Huntingdon County Farm Bureau at the weekly meeting Tuesday morning. Farm Bureau member Richard Morningstar thanked the commissioners for their support of the Huntingdon County Penn State Cooperative Extension, and member Rodney Davis said they continue to encourage the commissioners to help in any way they can to dealing with property taxes, as they can be a real issue for the agricultural industry in the county. “We know we have to do what we can to contribute our fair share, but we ask for fairness in doing so,” he said. Russell Kyper, also a Farm Bureau member, said property and school taxes from the local level as well as county, state and federal levels impact farmers, and he also mentioned that many property owners farmers rent from are feeling the pressure of property taxes. “Many of those we rent farmland from are older, so they can’t afford it,” he said. Commissioner Jeff Thomas noted that through the County Commissioners of Pennsylvania (CCAP), they’ve supported legislation and measures to shift the tax from just property taxes to sales taxes and other measures to make it fair for all county and state residents. Farm Bureau president Matt Barnett said agriculture is changing, and many farm operations are getting bigger in the county, so it’s important to dispel any misconceptions about issues like concentrated animal feeding operations (CAFOs). He also wanted to see if there’s a way to deal with a 2005 county subdivision ordinance that doesn’t meet state compliance. “We want to work with the planning commission to see if we can get something uniform for all townships,” he said. Also Tuesday, the commissioners gave approval for a owner-county agreement with the Central Counties Youth Center in Centre County, a juvenile detention facility that’s co-owned by the county as well as Centre, Clearfield, Mifflin and Clinton counties. The county’s allocation for 2019 is $173,858, that will be paid in four installments. “I know that since I initially took office in 2012, the price has gone up at least $100,000,” said commissioner Jeff Thomas. Huntingdon Borough resident Jim Cassatt asked if juveniles are guaranteed a space if they needed to be detained. “We are guaranteed space,” said board of commissioners’ chair Mark Sather, who explained other counties do contract, but owner counties like Huntingdon are guaranteed space if needed. Shannon Walborn, Children and Youth Services director, announced to the commissioners Tuesday that her department now has a full license. She touted the accomplishments of the staff to make it happen. Additionally, the commissioners also approved the purchase of a service agreement with Children’s Advocacy Center of Bellefonte for forensic interviews for child abuse cases for the 2018-19 fiscal year. This is a renewal from the previous fiscal year. Approval was also given for two tax assessment office staff to attend the Assessors Association of Pennnsylvania annual conference May 1-3 in Pittsburgh at a price of $540 and to attend the Universal Standard of Apprasial Practices class May 23-24 at the CCAP offices in Harrisburg. The cost for two staff members to go to this conference would be $275 each. The commissioners gave county mapping director Sean Houck the green light to attend the state Geographic Information System Conference in State College, plus pre-conference meetings, at a price of $280. Also Tuesday, the Emergency Food Assistance Program contract addendum was also given approval by commissioners for Center for Community Action (CCA), which includes language to reflect federal regulations and mandates that were already in place, but needed to be noted in the contract. A former SCI Huntingdon inmate will serve an additional nine to 27 years behind bars on escape and burglary charges relative to his departure from a prison work detail last summer. Huntingdon County President Judge George Zanic issued the sentence March 7 for John Adam Bertolette, 27, who is already serving a nine-to-18-year prison term on arson and related charges out of York County for setting fire to his relatives’ house. Bertolette’s Huntingdon County sentence — which includes three to seven years for escape and six to 20 years for burglary — will run consecutive to the sentence imposed by the York County court. According to state police at Huntingdon, Bertolette was a member of a prison work crew July 20, 2018, and assigned to the prison deputy’s residence along Route 26 in Walker Township just south of the Smithfield Towne Center entrance. At about 12:45 p.m., prison staff reported to state police that Bertolette was not accounted for. Police initiated a search by ground and air for the escapee. Police say Bertolette made his way from the work site to a residence along nearby Tanglewood Drive. There, police say the defendant entered the home, found a set of keys and stole a 2012 Ford Explorer belonging to the homeowner. Police report the homeowner was on the premises at the time and heard Bertolette enter and exit the house. Police say the victim assumed her daughter had returned home from Raystown Lake; instead, when she looked around the house, she discovered her Explorer was gone from the garage. Police say the victim then called her daughter to make sure she hadn’t taken the vehicle. Shortly after the pair ended their called, the daughter, who was traveling northbound on Route 26, was passed by a southbound Explorer. Police say she turned around and followed the Explorer, confirming it was her mother’s stolen vehicle. She called police and was able to photograph the driver who was later identified as Bertolette. Police captured Bertolette within an hour of his escape, at about 1:45 p.m., on Route 26 at Lakeview Drive in Lincoln Township near Marklesburg. Smith praised state troopers for their swift response to Bertolette’s escape and thanked witnesses who provided evidence that led to his capture. The escape charge is a third degree felony and the burglary charge, a first degree felony. In Pennsylvania, a third degree felony offense is punishable by up to seven years in prison and a first degree felony, by up to 20 years imprisonment. Bertolette was sentenced to state prison in January 2012 for arson, causing a catastrophe and burglary, all charges stemming from an incident that occurred June 18, 2011, at the home of his aunt and uncle in Newberry Township, York County. Township police report Bertolette had become angry at the couple and set fire to their home and two sheds using gasoline as an accelerant. Damage to the three structures totaled $370,000. Township police report Bertolette was captured nine days later following a high speed chase that ended with a crash at Linglestown in Dauphin County. A potential new program, as well as the fate of a mobile building that was slated for the CDL license and motorcycle license programs, were major topics of discussing at the Huntingdon County Career and Technology Center Joint Operating Committee monthly meeting Tuesday evening. Following up on discussion at January’s meeting, HCCTC executive director Don Burd gave JOC board members more information about the sports medicine program administration hopes to implement at the HCCTC. “The instructor in the program has to be a physical therapist, an occupational therapist, a physical therapist assistant, an occupational therapist assistant or an athletic trainer,” said Burd, further explaining certifications that would be received if a student would go through this program would be that of a physical therapist or occupational therapist aide. Additionally, with online programs available with adult education, Burd said they have access to some of the curriculum that could potentially be used for the sports medicine program. Burd said they also only have one health occupations instructor, and another one was not hired, though there’s still a budget for another position in that department, which could be filled by an instructor who is a physical therapist or occupational therapist assistant. Board chair Aden Russell said he is concerned students would have the right level of sciences to participate in the program, and Burd said the level of sciences needed would be the equivalent of a certified nurse aid. Additionally, Burd said the Allegany College of Maryland has expressed interest in an articulation program, where the school would guarantee students who take the sports medicine program a guaranteed spot for clinicals and an associate degree as a physical therapy assistant. HCCTC is also working with St. Francis University, where they already have an articulation program. Also Tuesday, Burd discussed a building that was slated to be used for the CDL and motorcycle license programs. Funds to pay for this project would come out of adult education funds, since the CDL and motorcycle license programs are adult education programs. “The plan was to get that installed as part of the building project, but since it’s not happening now, we need to decide what do to do move forward and treat that as a separate project,” he said. “The building has been sitting there for close to two years, and the plan was to try to put it on a basement foundation, and those who are doing CDL and motorcycle licenses could have access, but it would be close enough to hook up sewage. “Right now, if the project is over $25,000, then we have to worry about prevailing wage, and if that kicks in, it could be around $100,000,” he said. The basement foundation would be used for storage of documents, but Burd said if it’s going to be treated as a separate project, it may be cheaper to put in a different type of foundation, but they need to find a way to store documents. Documents are currently stored in a crawl space in the main building. Board member Candy Sonnenberg asked if they looked at scanning records as a means of record storage, and pointed out that upfront costs could be high, but it may be beneficial. Burd said they hadn’t, but would consider it. Tammy Peterson, JOC board member representing the Huntingdon Area School Board, also said retrieval costs for electronic files could be expensive. Russell told Burd to look into the cost of electronic record storage before they look into costs of setting up the building. Board members also reviewed and passed the audit from the 2017-18 budget year without concerns. A draft budget for the 2019-20 school year was also discussed, with Burd noting they need to pass a proposed budget in April.